Soak moong dal and urad dal separately for 3 hours. Grind moong dal coarsely adding sufficient water and a1/4 tea spoon of salt. 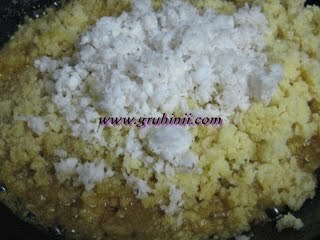 Grease Idli mold with ghee or oil. Pour the batter in the mold and steam for 10 to 15 mins in a cooker. Keep them aside. 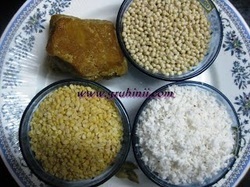 Grind the urad dal to fine dough adding sufficient water, a table spoon of sugar and 1/4 tea spoon salt. Keep it aside. When the Moong dal Idlis are cooled, grind them in a mixie. You can see in this picture how it looks after grinding. Now take the jaggery in a thick bottomed vessel. Add half cup of water. Heat it. 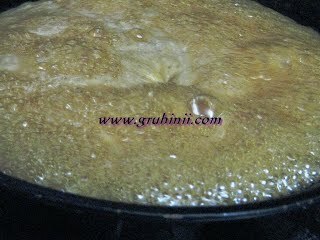 When the jaggery melts, strain and heat it again. 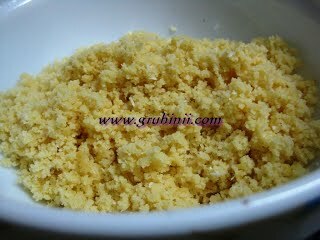 To it add the grounded moong dal powder and the grated coconut. Also add a tea spoon of cardamom powder. Mix well and cook until it thickens. Allow the mixture to cool and make lemon size balls. Now dip each ball in the urad dal batter and slowly place them in the oil. Deep fry until they turn to golden color. Remove and drain them on a absorbent paper. Serve them hot.........Tasty Pesara pappu boorelu/pesara boorelu are ready.....enjoy..... You can store them for 3 to 4 days. You need not refrigerate.